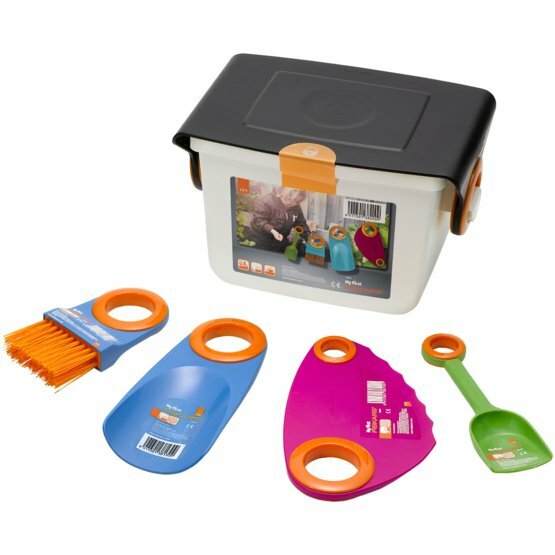 My First Fiskars Box Set is the ideal gift for any child who likes to get down in the dirt or sand or snow to build castles and exercise their imagination. The box set includes a big shovel ideal for two-handed building projects - from snow castles or excavating on the beach, a recognizable smaller shovel at home in the sandbox or at the seaside, a snow saw for cutting and sculpting snow but equally useful in the garden for digging and even planting and a neat handheld brush for sweeping and brushing off other toys and tools. The box itself doubles as a handy seat in wet conditions or a mould for building ice blocks while the lid can be used a slider for winter fun.